Secluded, private and romantic modern vacation rental cabins on 20 wooded acres, close to restaurants and Cook Forest attractions. our ten great cabin rentals are located on approximately 20 private and secluded acres. You may enjoy the romantic setting of your wood burning, gas log fireplace or your outdoor picnic/fire pit area. In addition, all of our pet-friendly cabins are equipped with auxiliary furnaces and satellite TV for your enjoyment. Try out our just recently renovated Sugar Pine Cottage, suitable for 2 persons, a one bedroom suite with a Jacuzzi tub in the bathroom as well as a shower. The cabin has been totally redone and appliances, walls and flooring replaced. New photos are available on this site. The Cook Forest area offers a variety of outdoor entertainment; such as, go-karts, bumper boats, mini-golf, water slides, horseback riding, canoeing, kayaking, tubing, arcade games, fishing, hunting, plays, musicals and festivals. Cook Forest State Park has over 30 miles of hiking trails and many miles of biking trails. Our “Old Growth Forest” at the “Forest Cathedral” is a popular hiking spot for many of our guests. Need help planning your next family cabin vacation? FREE E-Book of Cook Forest Area Events, Attractions, Restaurants and Shopping, Our Book of Fun Things to Do in Cook Forest. For your next family vacation or romantic getaway in a great cabin at Cook Forest State Park, reserve with Cook Forest Top Hill Cabins now! Blue Spruce features a large combined living room & dining area. A separate country kitchen has microwave, stove, refrigerator, toaster, coffee pot, dishes, cookware and silverware. The living room has satellite TV and a wood-burning fireplace. The cabin has bathroom with a shower. Blue Spruce Cabin sleeps 2 to 6 persons in 2 bedrooms. There is a queen bed in the master bedroom and 2 double beds in the second bedroom. The outside picnic area for Blue Spruce Cabin includes a gazebo with a swing as well as a large back porch furnished with wood outdoor furniture. There is a picnic table, charcoal grill and fire pit in the picnic area..
Buckeye Cabin is a totally equipped, rustic cabin that you will love! The wrap-around deck will let you watch all the wild life that Cook Forest has to offer right from the cabin. Buckeye has a combined living room with wood burning fireplace and dining area. The kitchen comes with microwave, stove, refrigerator, toaster, coffee pot, dishes, cookware and silverware. The living room is equipped with satellite TV for your enjoyment. This cabin also has bathroom with a shower. Buckeye sleeps 2 to 4 persons in 2 bedrooms. There is a queen bed in the master bedroom and 1 double bed in the second bedroom. The outside picnic area has a large wrap around deck furnished with wood outdoor furniture. Included, you have a picnic table, charcoal grill and fire pit in the picnic area. ​This property has 1 Queen(s), 1 Full(s). large knotty pine living room with wood-burning fireplace. Douglas Fir Cabin, one of our most popular cabins, is in a wooded area where you will enjoy seeing wildlife right from your large back porch. DF has a large wood burning fireplace for your enjoyment plus auxiliary gas heat is provided. The dining/kitchen area includes microwave, stove, refrigerator, toaster, coffee pot, dishes, cookware and silverware. There is a satellite television in the living room for your enjoyment. Your bed linens are furnished in 2 separate bedrooms. One bedroom has one Queen Bed and the other bedroom has a set of double bunk beds. There is a bathroom with a shower. You will need to furnish your own towels for showers. Outside of the cabin, you have a large porch with wood lawn furniture and a gazebo with a swing. The picnic area includes a picnic table and chairs with an outdoor fire ring and a charcoal BBQ grill. ​This property has 2 Bunk(s), 1 Queen(s). porch with plenty of outdoor furniture and is one of our largest and roomiest cabins. This cabin interior has been completed with knotty pine wood. Hemlock Haven has 3 bedrooms & a great room area with combined kitchen/dining/living room. Sleeping up to 8 persons, this cabin provides a wonderful family retreat. Hemlock Haven has a large brick gas log fireplace and an auxiliary gas furnace for your winter enjoyment. The large country kitchen is fully equipped with microwave, stove, refrigerator, toaster, coffee pot, dishes, cookware and silverware. In the living room area you will find television with satellite programming, DVD, 1 couch, 3 chairs, fireplace. Sleeping arrangements have two bedrooms, each with a double bed.The third bedroom offers a Queen bed and a set of twin bunk beds. Your bed linens are furnished and there is a bathroom with a shower. You will need to furnish your own towels for your showers and paper products. 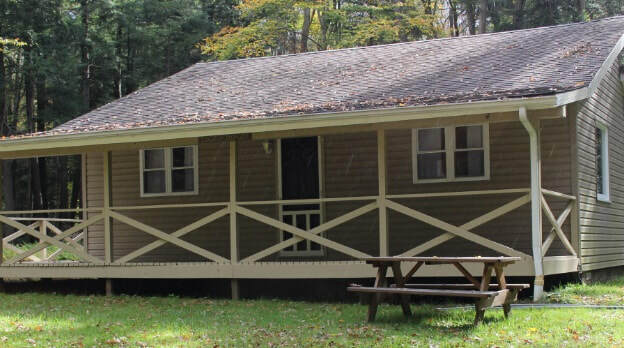 Hemlock Haven is on over 2 acres of land and includes an outdoor picnic area with fire ring, lawn furniture, 2 picnic tables and charcoal grill. The large wrap-around porch gives you an outdoor place to relax while watching the deer, birds, squirrels and chipmunks that are plentiful in the Cook Forest area. This property has 2 Full(s), 1 Queen(s), 2 Twin(s). Hidden Oaks Cabin, ​a beautiful and secluded 3 bedroom/2 bath cabin, is surrounded by huge oak trees. This cabin was refurbished in April of 2012 to include a third bedroom, second bathroom and log siding. Hidden Oaks is nestled in a private wooded area of our campground. This cabin features a fully equipped kitchen with microwave, coffee pot, toaster, stove, refrigerator, cookware, dishes and silverware. In the large living room area, you will find a couch, large chair, wood rocking chair, end tables, television with satellite TV and a DVD player. With your comfort in mind, the entire cabin is carpeted and auxiliary gas heat is provided. Hidden Oaks Cabin has a fully-equipped kitchen, living room/dining area, three (3) bedrooms and two (2) bathrooms each with showers. You will need to furnish towels for your showers. This cabin's accommodations include two bedrooms with queen beds and one bedroom with a double bed and set of twin bunk beds. Hidden Oaks is situated on approximately 2 acres of land and is great for viewing wildlife of the area. Included also is an outdoor picnic area with fire ring, lawn furniture, swing, picnic table and charcoal grill. The cabin also has a large back porch furnished with wood lawn furniture. This property has 1 Full(s), 2 Queen(s), 2 Bunk(s). Old Hickory Cabin features three bedrooms all with queen beds plus a large front porch with plenty of outdoor furniture. You will also find a wonderful stone, wood burning fireplace in the living room and a large, lush lawn. Old Hickory Cabin is a three bedroom cabin with a great room that has a combined kitchen/dining/living room. With accommodations for up to 8 persons, Old Hickory will provide your family with a vacation to remember. Old Hickory has a large stone wood burning fireplace in the living room as well as an auxiliary gas furnace for your winter warmth and enjoyment. The large country kitchen includes microwave, stove, refrigerator, toaster, coffee pot, dishes, cookware and silverware. The living room includes television with satellite programming, DVD/VCR, 1 couch, 3 chairs, end tables and fireplace. Sleeping arrangements have the first bedroom with 1 queen bed and a set of twin bunk beds. The second bedroom has 1 queen bed and the third, newest bedroom has 1 queen bed. Your bed linens, pillows and blankets are furnished. The bathroom has sink, shower and commode. You will need to furnish towels for your showers. Old Hickory is located on 5 wooded acres of land and includes an outdoor picnic area with fire ring for your outdoor campfires, lawn furniture, picnic table and charcoal grill. The large front porch gives you a great place to view the deer, squirrels and other wildlife that visit the cabin frequently. Campfires permitted!